Now find all the oil & gas tenders from India on a single platform. Take a leap forward in your business by browsing through tenders floated by ONGC, Saudi Aramco, IOCL, HPCL, GAIL, ADNOC and many more reputed organizations. We are here to simplify the complex business processes for you. Browse through an array of global tenders from the Oil & Gas industry offered to you within 24 hours of their official release. Notice for open plots for setting up CNG Stations in Ranchi & Jamshedpur City. Energy Dais is a global movement that brings together the entire Oil & Gas community on a single platform. The idea is to enhance cross organizational and international efficiencies through shared resources and common goals. JOIN NOW to become a part of our global network of Oil & Gas companies. Join the growing network of Oil & Gas organisations and professionals. Stay updated with the latest developments in the global Oil & Gas Community. Browse through hundreds of thousands of oil & gas tenders from across the globe, provided to you within 24 hours of their release. 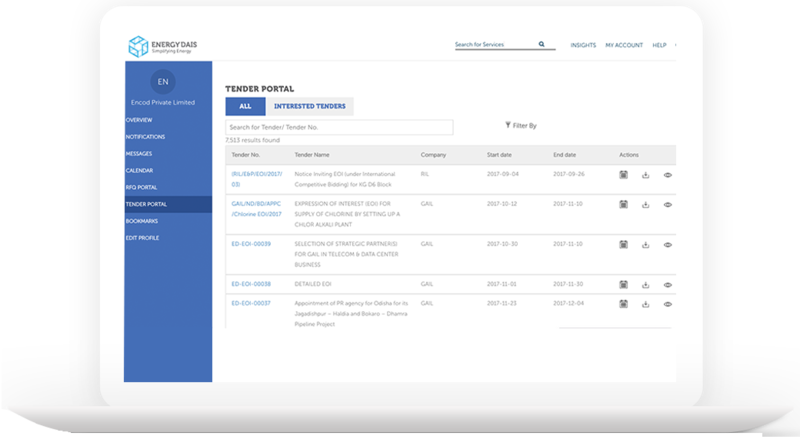 Take control of what goes on your interactive company page by updating details of your company’s work stream, revenue, past projects, licenses and much more. Energy Daisis an online oil and gas companies directory. It gives every individual, industry professional, and company related to the oil and gas industry an opportunity to enhance their knowledge, to find their dream job and a global presence respectively. For oil and gas companies, joining our platform gives them a competitive advantage over the others in the ever growing oil and gas industry. Through our website www.energydais.com, even local players in the oil and gas industry get global visibility. To grow your business, we have an exclusive oil and gas tender portal on our website. And, by signing up with us, you get all the tenders floated by any oil and gas companies around the world within 24 hours of their official release. Being a prime destination for oil and gas tenders in India we have the most exhaustive information and inventory of oil and gas tenders floated across the world by any oil and gas company. For India, the major PSU’s float tenders but people often find it hard to find these tenders. So, if you’re looking for IOCL tenders, ONGC tenders, Indian Oil tenders, Oil India Limited tenders, and GAIL India tenders then Energy Dais is the platform where you should be. Further, we help you with all the information you need related to the bidding the tenders i.e. a guide and an introduction to bidding oil and gas tenders in India. Read our blog, How to bid for oil and gas tenders in India, a step-by-step information for anyone who needs to know everything – from the time when tender was floated to the award of the contract – about the tendering process in India. For oil and gas tenders in India, like for other tenders, the process is completely digital. It is compulsory for anyone who is interested in participating in the oil and gas tenders in India to have a digital certificate and other constraints which the up and coming entrepreneurs and businesspersons find it hard to decipher. And sometimes the process to participate in tenders in one company is different from the other; keeping this in mind we also have special ‘How To’ section in our insights section. Our exclusive ‘How To’ blogs cover the IOCL tenders, ONGC tenders, GAIL India tenders, Oil India Limited tenders, Indian Oil tenders etc. With this information and Energy Dais’ support with you to grow your business participate in IOCL tenders, ONGC tenders, GAIL India tenders, Oil India Limited tenders, Indian Oil tenders etc. Help us in helping you, get the access to these guides and to avail all the tenders you need to grow your business – and not only that: access to a verified database of oil and gas companies, float and receive RFQs, oil and gas job portal (coming soon) – sign up with Energy Dais today. For more information on this and if you need any consultancy regarding the bidding process of oil and gas tenders in India for IOCL tenders, ONGC tenders, GAIL India tenders, Oil India Limited tenders, Indian Oil tenders etc. visit our website www.energydais.com today or write to us as contact@energydais.com. for any query. Please share your contact details to get access to download the tender documents.